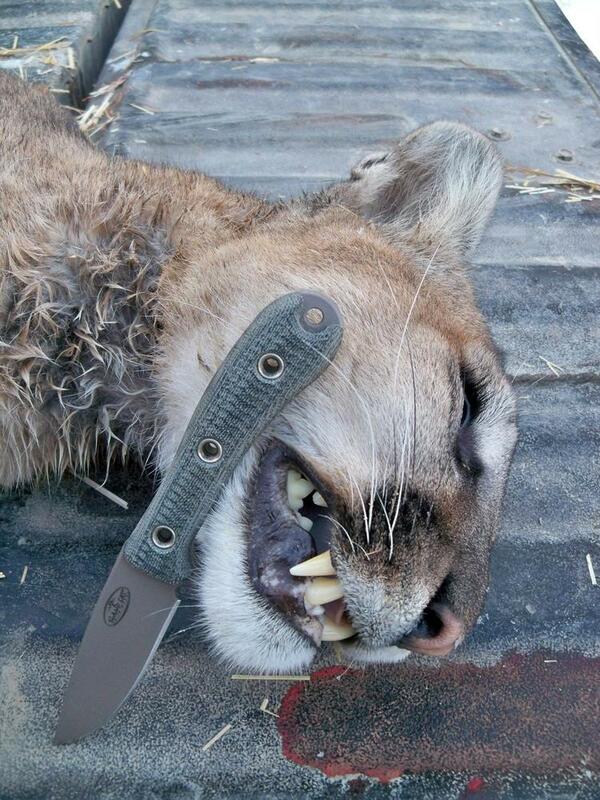 Sticking out of a mountain lions backside... That's got to be 1 of a kind right? Very nearly! Now put that story in the hunting story thread! Hmmmm....apparently I have forgotten how to embed pictures??? Fixed it for you Ian. If you're asking about my picture Ian, that was from a few years back. My boy had the bug to go get a lion caught, so we spent most of his Christmas break trying to round one up. There were several in this one ranch that the owner was wanting out, but we couldn't get the weather conditions to cooperate. Lion hunting with hounds (or hound hunting in general) is all about conditions. If the dogs can smell it, you're in good shape.....if they can't, then it doesn't exist to them. So the cats that were working the drainage were crossing from the North faces to the South faces, the North having snow held on it, and the South bared off which is where the game was staying. Snow will hold scent many times longer than bare ground and even though we kept trying tracks with the dogs, they couldn't pull enough scent to put an end to the track. I told my boy, just be patient, one will slip up and cross back over where we've got the right conditions to get it caught. Well, we kept at it for about a week and his vacation ran out and he had to go back to school. The owner was still on me to get some pressure on the lions in there, so I ran the line without my boy and bam! there's a very fresh lion track crossing just where we need it. I got one of my young dogs out that had never caught a lion on its own and started the track with him. With the field glasses we saw my pup jump the cat out of a big brush pile halfway up the mountain and both came barreling off toward the creek. It's real open country there along the Snake River breaks, and the only thing for a cat to climb is the trees along the creek. The lion wanted across the road and into the bluffs up above me, but it didn't (thankfully) want to run through me to get there, so upstream it went until my pup closed enough distance to force it to tree. I didn't want this one for myself, but I was sure they could hear the race from the ranch house, and I knew I'd probably get an invitation to not come back if I didn't kill it. Which was too bad because my boy had put a lot of effort in but that's how it goes sometimes and he understood. I was lucky enough to draw a coues tag here in central AZ. My buddy and I were up on a rocky peak glassing for deer about an hour. I walked over to him and said we should move on around to the other basin... This lion popped right up on the saddle not 80 yards in front of us! I popped 2 rounds into it's chest while my buddy nearly panicked. We sat there about 30 seconds trying to gather ourselves.... And there was another lion right there! Bang we put it down where it stood. The 1st one despite being double lunged managed to slip half a mile down the canyon. I crawled through the thickest bush I've ever been thru on my hands and knees with just a pistol... Fearing a wounded lion, I was a bit nervous! Finally tracked it to the bottom where we tried it and finished it off. I've caught them on trail cameras up there every time I've set them... Only played eyes on 1 up there before... But 2 right in our lap was pretty special. Used the swamp rat to get through the elbows and neck. Managed to think of y'all up and snap a picture. That blade is sweet! Great stories fellas, thanks for sharing them. That is a great story MtnRat! Thank you! I always enjoy reading our little group's experiences. I echo the thanks. 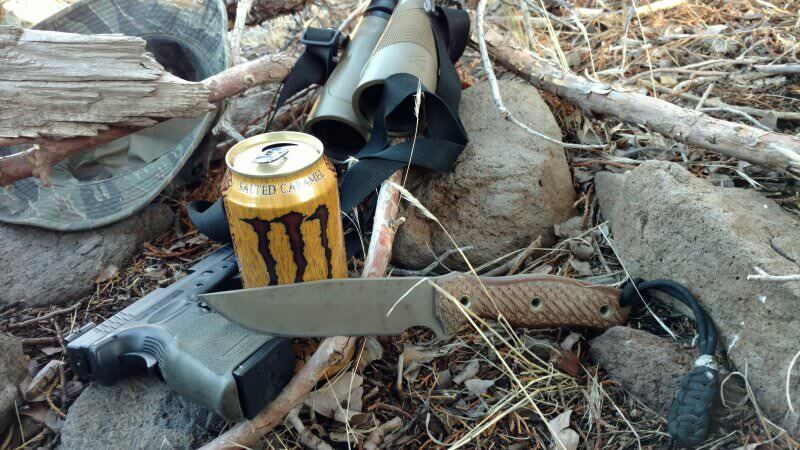 Good picture MtnRat, is that a soft drink "Salted Caramel" ? Generated in 0.038 seconds in which 0.027 seconds were spent on a total of 14 queries. Zlib compression enabled.